A few years ago, while visiting a friend at McMaster University, I noticed he had several plastic bins scattered through the rooms. When I inquired about them, he told me that was helping to set up composters as part of an environmental awareness student group but he mentioned that these ones had a unique twist. As he slid over a box and popped the lid open, I was preparing myself for a whiff of rotting and decaying food…not the prettiest of sights and certainly not something to be kept indoors. Instead to my relief, there was no smell and or rotting food but rather a thin layer of dark black soil. “This is the gardener’s version of black gold!” exclaimed my friend. But how or what did he do? He dug away the soil and lifted it up for me to see. I could see layers of newspaper and plant waste but nothing out of the ordinary. But in the palm of his hand, he held five or six tiny earthworms known as “red wrigglers” — not the type you go fishing with, but small and very active. The secret was in the worms! The worm casings were a by-product of their metabolism and is the ultimate plant fertilizer. 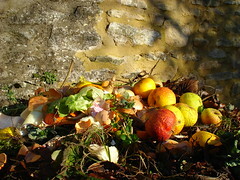 The use of earthworms in composting is known as vermi-composting. I was impressed by this idea and suggested that we put together a kit to sell to schools for teaching recycling and composting. It looks like we weren’t the only ones with the idea. Fastforward five years and I stumble across this article from Inc magazine. Tom Sakzy took the premise of vermi-composting to the next level and created an organic waste recycling facility called TerraCycle in New Jersey. It utilizes earthworms to decompose organic waste, produce soil and an innovative organic plant fertilizer. His company was started in 2003 and now has over $5 million in sales. He has also attracted over $4.3 million in angel financing and now looking to move his company to the VC and public markets. The beauty of the product is that it is also packaged in recycled bottles and shipped in leftover print material. Currently, it is being sold in Walmart and Home Depot but Tom is looking to aggressively expand to other distribution stores such as Target and Lowe’s. Talk about investment in the environment!